Pastor Vodislav and his wife, Erji, (Elizabeth), currently live in Timisoara, Romania; he is pastor of the Noul Legamant Church in Lugoj. 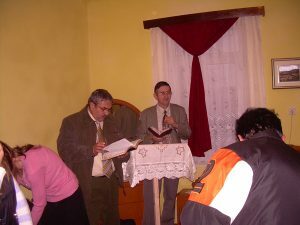 The church is celebrating eight years of ministry in Lugoj since their first evangelistic tent meeting. About 40 to 45 people attend the Sunday morning worship services; the youth group meetings at times have as many as 20 attendees. The Christian Center in Timisoara which is the covering for all of the newly planted churches in Romania has requested that each church become a legal identity for financial and material purposes. Since January 2011, Noul Legamant has become a legal association. It is still under the covering of the center for spiritual guidance and leadership. The financial gifts from a church in Rockland, Maine help Pastor Iulian mainly with transportation to and from Timisoara, to bring the people to church from surrounding villages, and to visit home groups. With gas in the $7/gallon range, this support is a big help. It also helps with special events and needs which are not covered by other offerings. Further financial support would be greatly appreciated and would be used to assist in the ministry of reaching the unsaved for Christ and for discipling new believers.